I will be an aunt again soon – but this time it will be a nephew arriving! So, of course I started on some more baby room art. Nothing like a deadline to make me complete artwork – I love being forced to work. This time around, I took a different approach, and strayed away from the more cutesy colors/motif. Honestly, I have mixed feelings about the end result. I am always my own worst critic, especially when I am making artwork for others. It turned out a little darker on the bottom end than I anticipated, but hopefully once it is in the red frame I found, it isn’t too depressingly black and gray for a baby’s room. 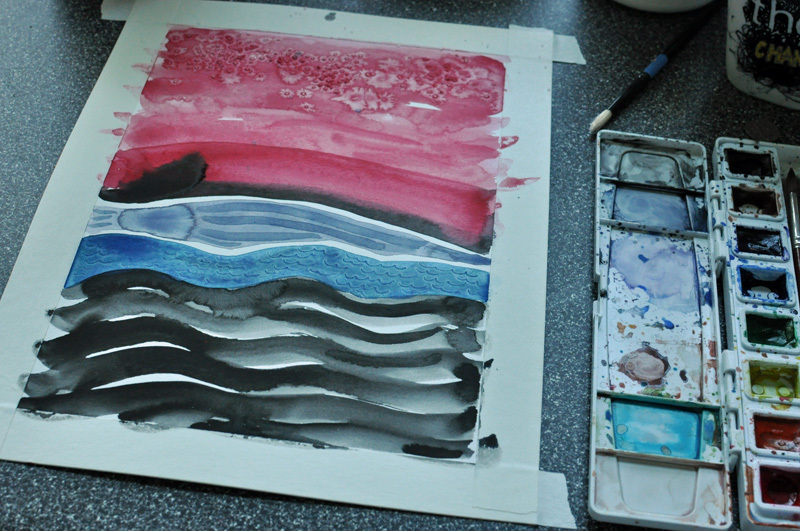 I started with a watercolor background – sticking with grays and reds and some blue. I used salt on the wet red paint to achieve the frost-like texture at the top of the red section. 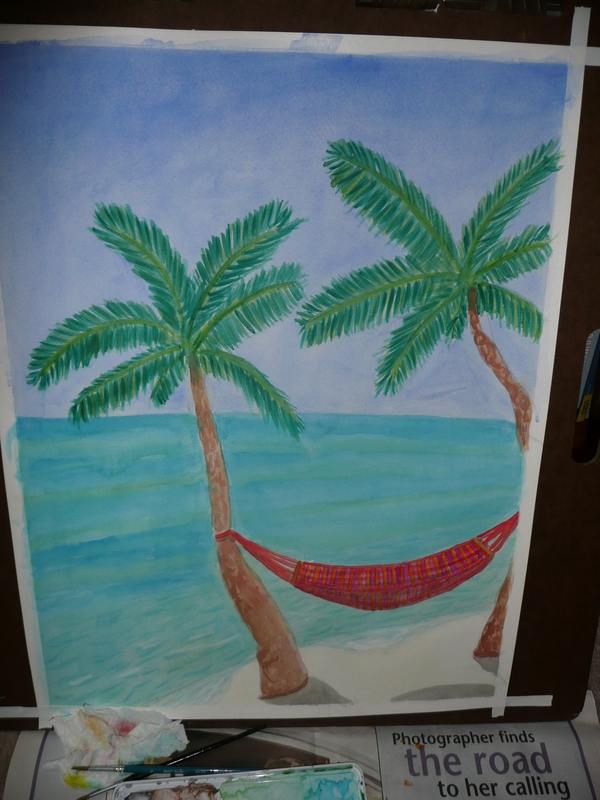 Hammock, watercolor on paper, 18 x 24″, July 2007. Liz, you may be getting a round 2 of your ich liebe dich, artwork in the near future. I did this very same thing with a tropical island painting, see above, that I made for a friend’s wedding. She asked to see my reject, and then liked it enough that she asked to have it as well. I was so frustrated with the reject and the ugly shadow below the hammock, that I did not even take a photo. The only image I have is of beach scene 2.0. Ich Liebe Dich, watercolor & collage on paper, 8 x 11″, July 2015. 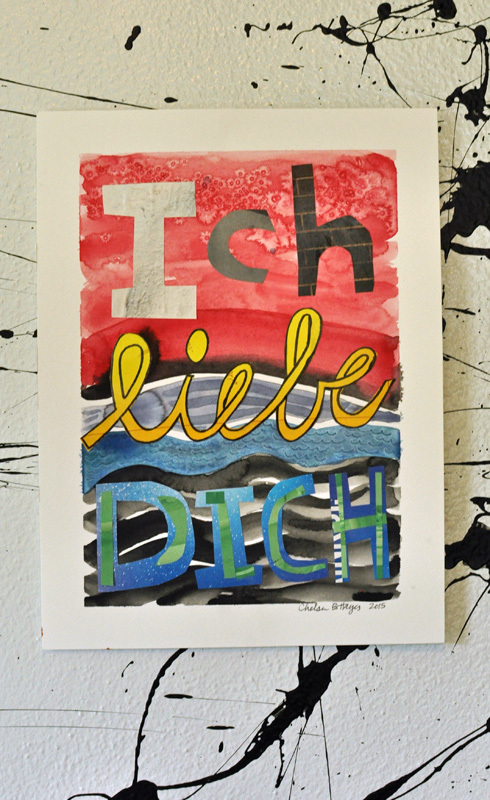 After the painting background was dry, I created the words, “Ich liebe dich,” which means I love you in German, from magazine collage. The finished baby art – primary colors with a hint of minty green. 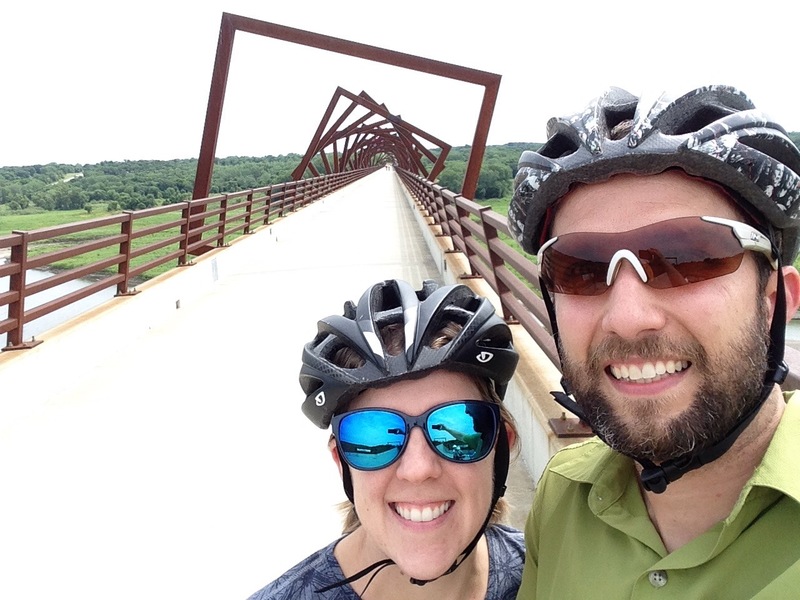 Last Sunday we finally made our way to the High Trestle Trail in Iowa. We started in Woodward, Iowa, which is about a 30 minute drive from Des Moines. We drove up after breakfast, fully loaded with snacks, water bottles, and the orange bike sticking out on either side of our car rack like an large orange dragon. 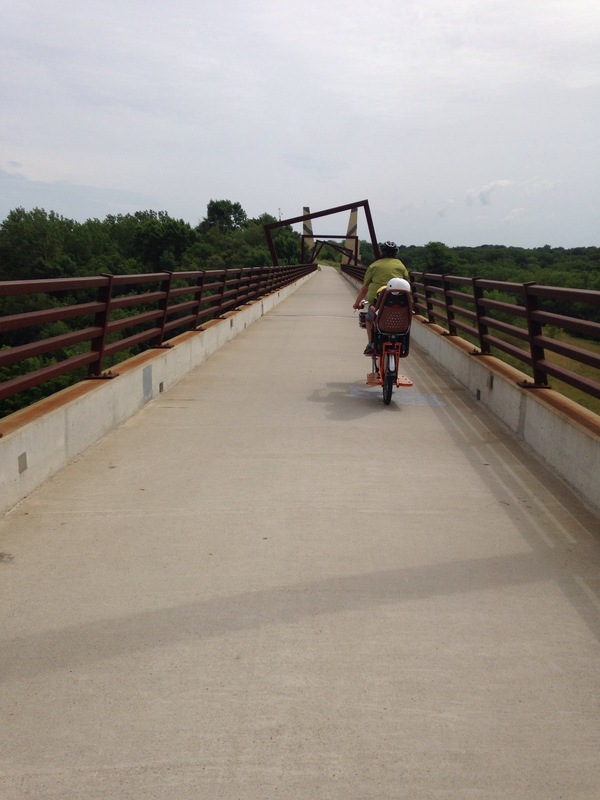 We parked in the High Trestle Trail parking lot and promptly realized we left the entire diaper bag at home. So, off we road to a local gas station that was teeming with coffee sipping cyclists. It’s amazing to see what a bike trail can do for small communities. 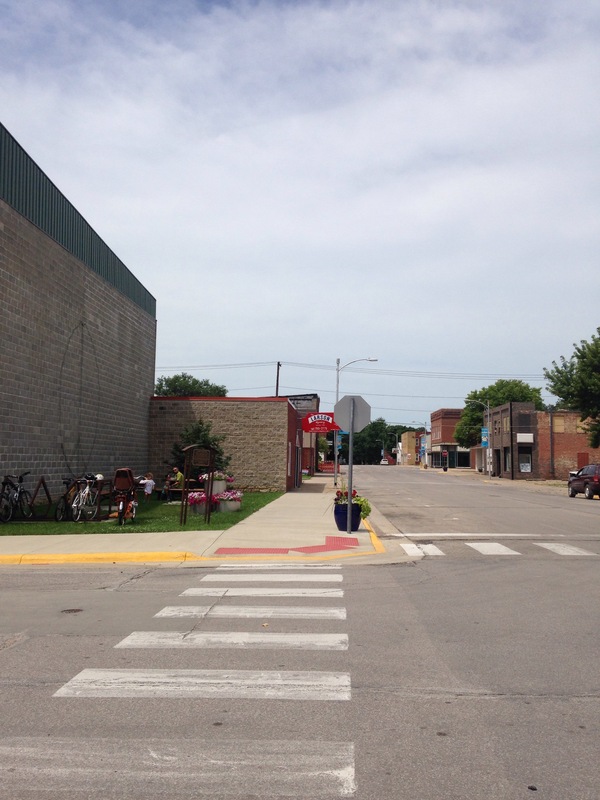 The best part – we were banking on lighter crowds due to the start of RAGBRAI. 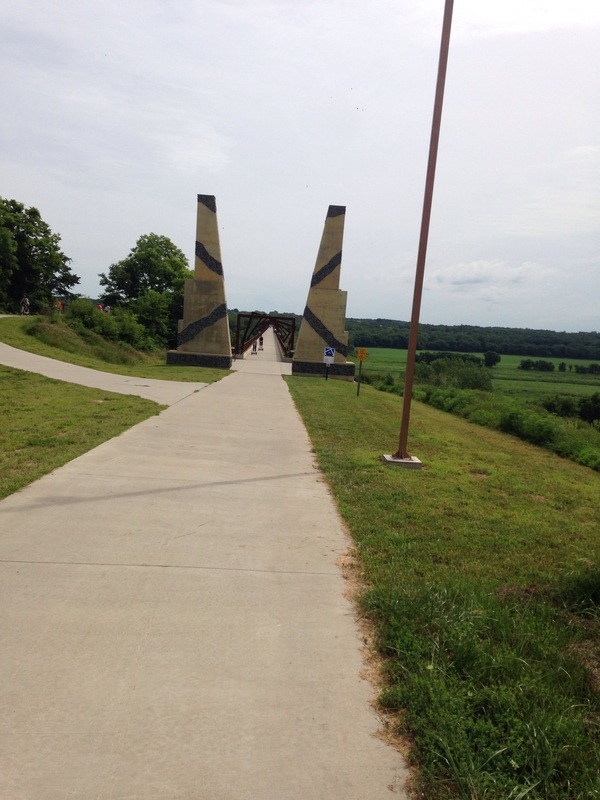 It is an easy 3 mile ride from Woodward to “The Bridge,” as it is dubbed. 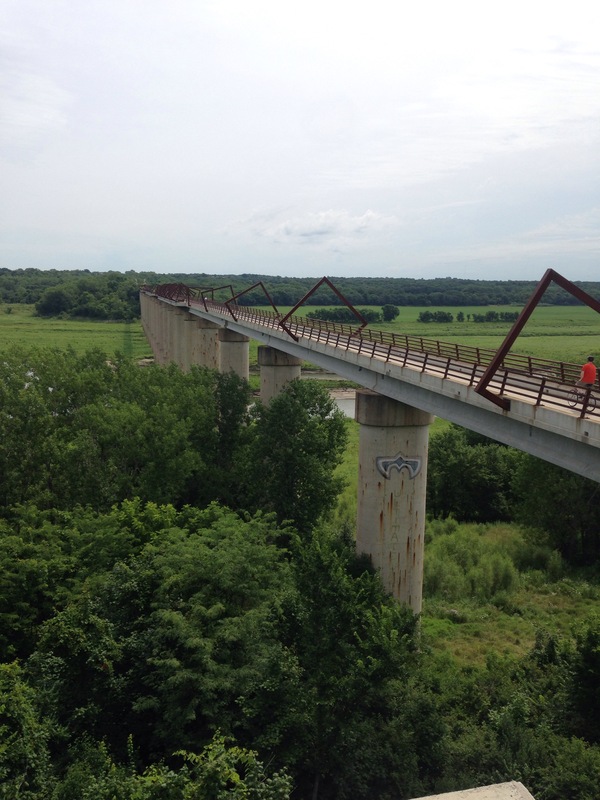 The High Trestle Trail Bridge is a 13-story, 1/2 mile long bridge that was formerly a railroad bridge. 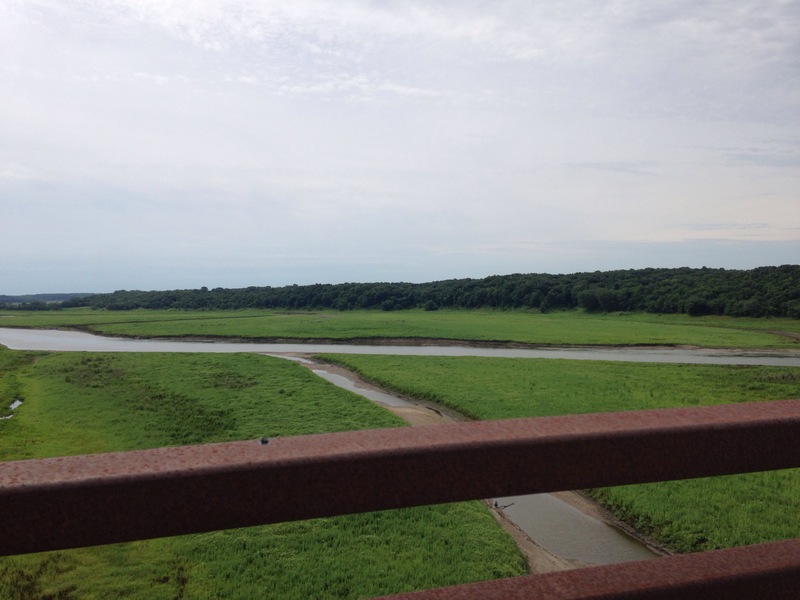 There are outlooks along the bridge that spans the Des Moines River, with informative signs detailing items such as river wildlife and cultural features. There are 41 steel frames over the bridge which are meant to represent the frames used in historic coal mines. The pillars at either end of the bridge have ceramic tiles created to look like coal veins. We stopped the orange dragon at the first major scenic overlook, where we had nice views of the entire span of the bridge. The kids were in great spirits and just wanted to be on the bridge. I love taking this bike out – everywhere we go we get compliment and questions. I think most people just assume that a bike trailer is the only way to ride with kids. We used a bike trailer at first, but once we found out #2 was on the way, we started to explore other options. We have discovered that a cargo bike is more enjoyable for adults and kids alike for a few reasons: A. it is lighter and easier to turn on a fully loaded cargo bike than you’d think. B. 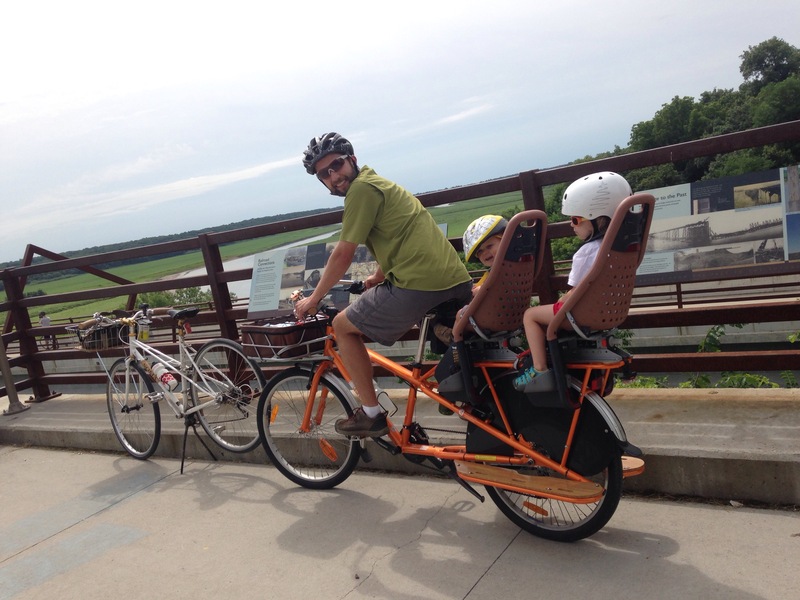 The cargo bikes can be configured in a variety of ways to suit your family. C. Kid passengers are not enclosed in a hot trailer, stuck in a reclining position, but are able to sit up and interact just as the adult cyclists are able to. We bought our cargo bike from REI, but check around your area for dealers. Even if you are not in the market for a cargo bike, I highly recommend the Yepp Bicycle Seat as an alternative to a trailer. They can be used on regular bikes as well. We stopped at an overlook for a selfie. Yay for not being on RAGBRAI this year, and enjoying this inaugural ride with fantastic Iowa countryside views. As you can see, the bridge is deserted! It was not this empty on our return ride after noon, though. The verdant valley with the Des Moines River. Lots of rain = a very green Iowa this year! The pillars at the far end of the bridge. We are heading on toward Madrid, Iowa (not pronounced like Madrid, Spain). We found a great lunch spot in Madrid. 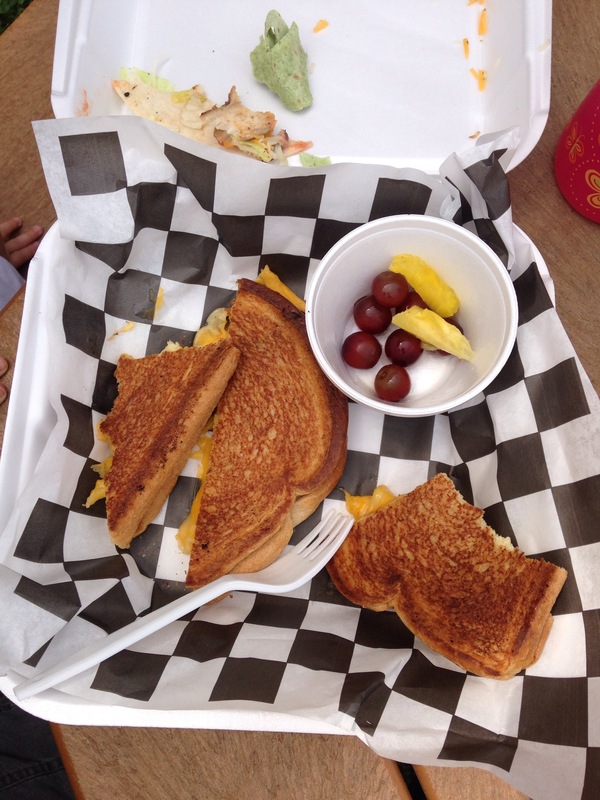 The kids split grilled cheese, fruit, and mac and cheese. As my daughter said, “It is so good, it tastes like candy.” There you have it, a strong endorsement from a 4-year old. 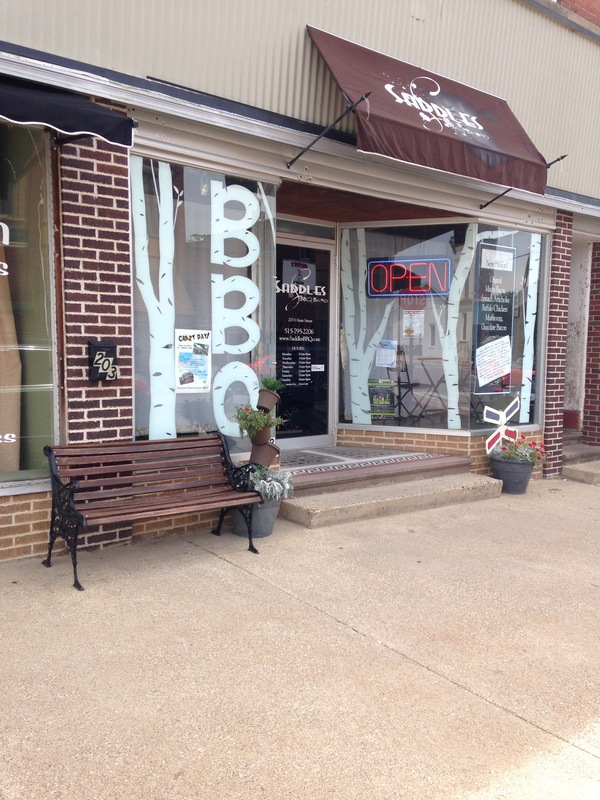 Saddles BBQ Bistro was the perfect mid-ride stop. The kids were happy with their meal and Eric and I enjoyed our wrap and tacos immensely. Madrid was a little deserted on this Sunday at lunch time, so we opted to eat our lunch outside. 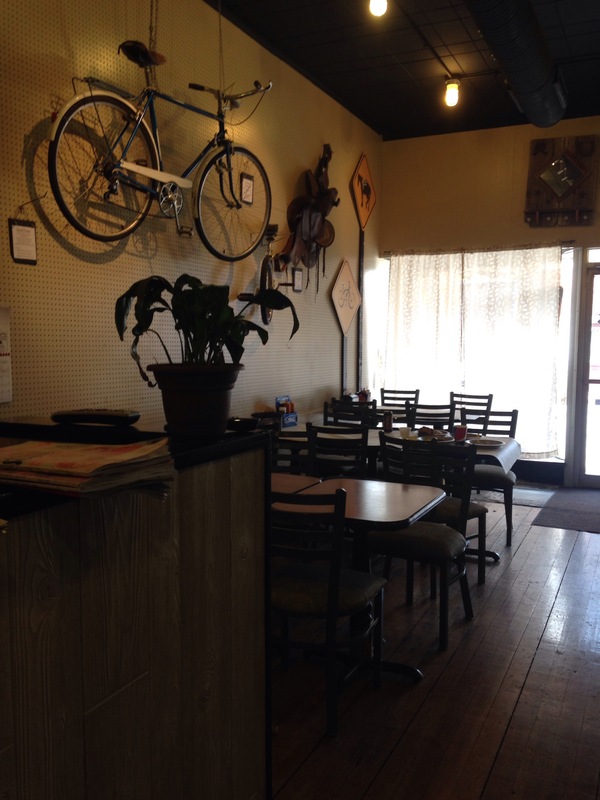 However, the inside of the restaurant was tastefully outfitted in cycling and Western riding decor. 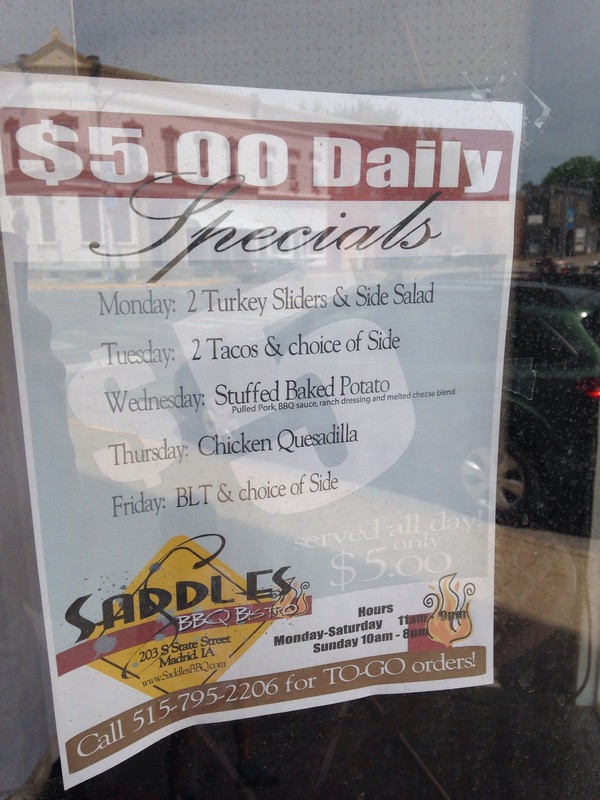 We chose to dine al fresco in a small picnic area directly across the street from Saddles. This way, the kids could stand and dance while eating. They both get antsy after sitting on the bike for a while. The weekday specials were prominently displayed in the front window. After finishing our meals, we packed up and headed back toward Woodward. It is only 6 miles between the two towns, so all in all, we ended up doing an easy 12 miles. My favorite shot from the day – selfie in motion. Next time, we will ride more of the trail and hit up some of the infamous watering holes along the route. Cheers! 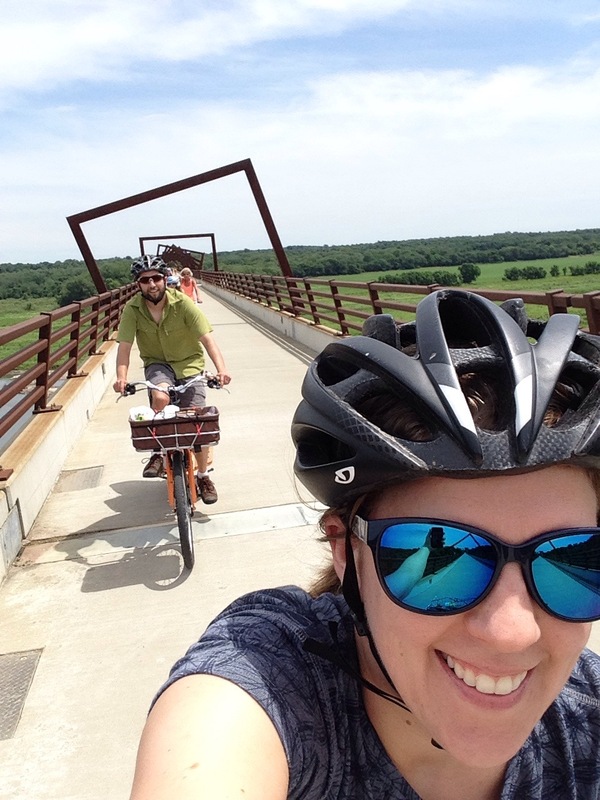 What’s your favorite bike route? 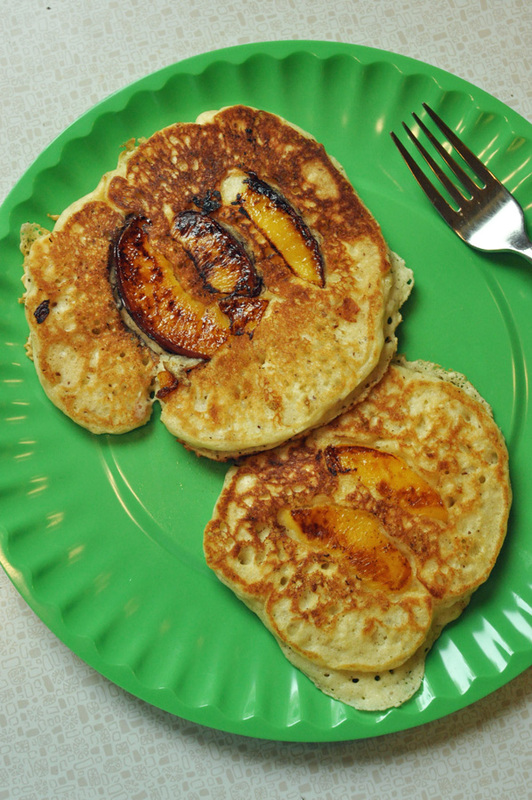 These breakfast bad boys came about due to an abundance of ripe nectarines, reminiscing about North Carolina beach breakfasts, and my absolute undying devotion to making delicious breakfast foods. Fact: I am much more likely to go all out on breakfast than any other meal of the day. Nectarines are right up there with peaches and black raspberries as my favorite fruit. I mean just look at them! They are perfect golden slices of sugary goodness. As with the other two fruit favorites, they are best eaten in season. I bought a bunch of these nectarines with the intention of grilling them and serving them with ice cream, but that did not happen because we went for strawberry ice cream cones instead. 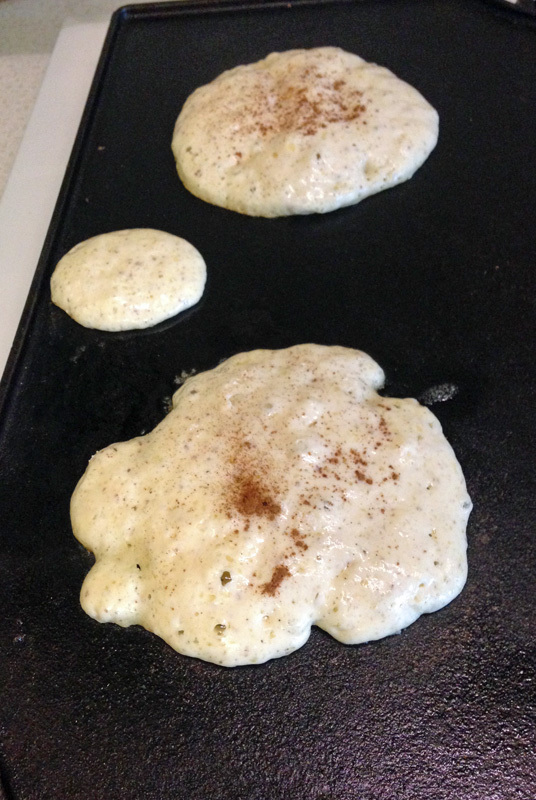 So, the following morning, I peeled them and thinly sliced them to be put into my favorite basic pancake recipe. 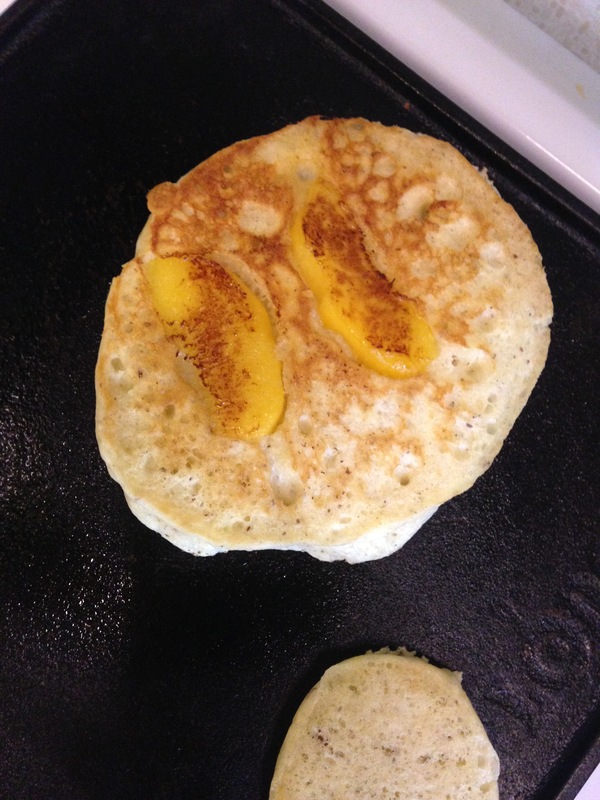 Then, I placed tabs of butter on the hot cast iron griddle, and cooked the thin slices of nectarine for a few minutes on medium heat, until they were softened and the butter was bubbly brown and caramelized. This griddle is a must-have in my kitchen – we bought our two-burner cast iron griddle a few years back and use it pretty much every day for breakfast. Next, I poured about a 1/2 cup of batter on top of the caramelized slices and sprinkled some cinnamon on top. I let it cook for 2-3 minutes, or till the edges were starting to dry and bubbles appear on the surface of the pancake, but don’t yet break. Check for doneness by gently lifting the edge of the pancake with a spatula. Nectarine perfection when flipped! I cooked the pancakes for 1-2 more minutes on the other side, check though, as the other side never takes as long to cook as the first. 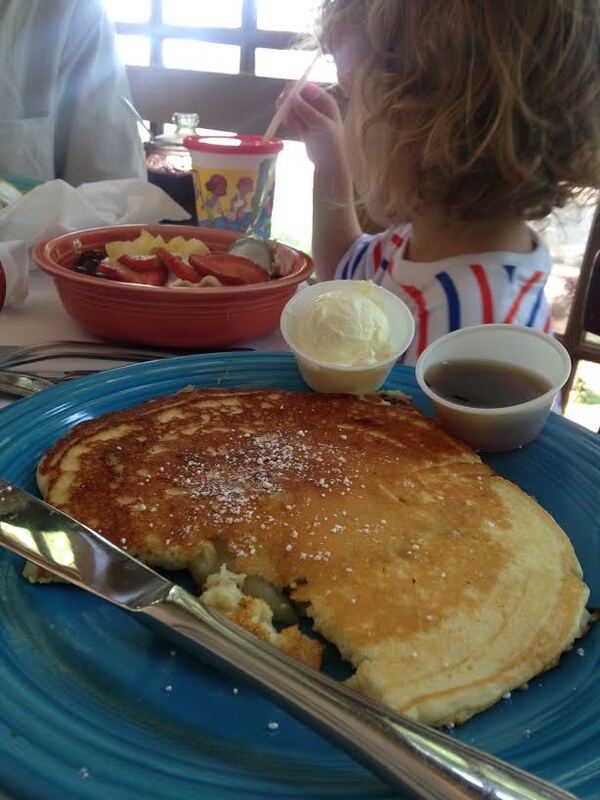 That little plain guy is for my youngest – he was happier to eat his foods separated. Check below for the base recipe of this easy, yet decadent pancake recipe. Note: I used all-purpose flour instead of cake flour. I never have that specialty flour around. I recently read that the best pancakes are the ones that are mixed, covered, and refrigerated for 3-6 hours, or longer before cooking. I will be testing this out for tomorrow – check back for the results. Buttermilk Pancakes (from Joy of Cooking) Makes about ten 4-inch cakes. 1. Combine: 1 cup cake flour, 1 teaspoon sugar, 1/2 teaspoon salt, 3/4 teaspoon double-acting baking powder, 1/2 teaspoon baking soda. 2. Beat until light: 1 egg. Add: 1 cup buttermilk, 1-2 tablespoons melted butter. 3. Combine the dry and liquid ingredients with a few swift strokes. 1. Mix pancake base from buttermilk pancake recipe above. 2. 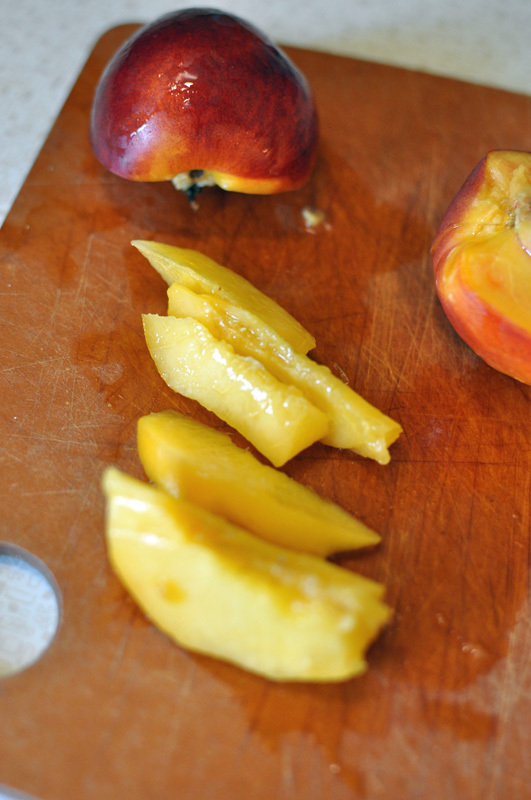 Slice and remove pits from 2-3 ripe nectarines. Peel and thinly slice. 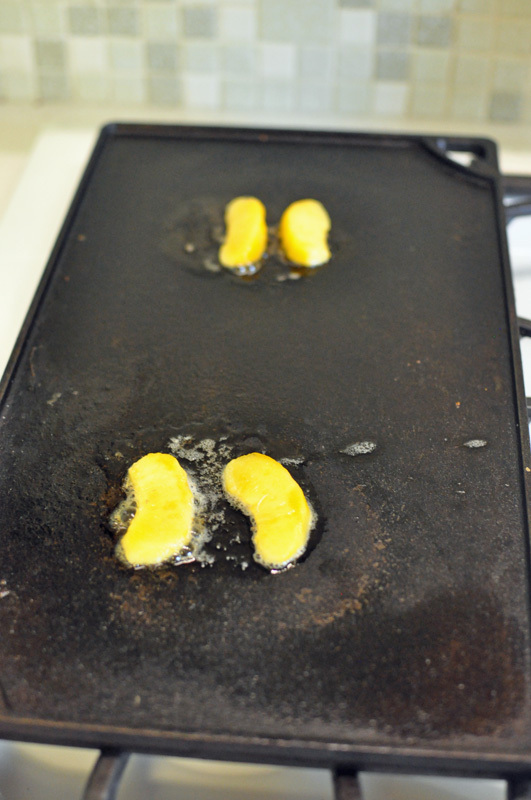 Place small tabs of butter onto a hot griddle and place 2-3 slices of nectarine in the melting butter. Use a fork to move the slices around so they are coated in butter. Allow them to caramelize by cooking the slices over medium heat for 2-3 minutes, or until the slices are softened and the butter is bubbly and slightly browned. 3. Pour about a 1/2 cup of batter over the top of the caramelized slices and a sprinkle a dusting of cinnamon on top of the batter. Cook pancakes for 2-3 minutes, or till the edges start to dry and bubbles appear on the surface of the pancake, but don’t yet break. Check for doneness by gently lifting the edge of the pancake with a spatula. Flip pancake and cooke 1-2 more minutes on the other side. Watch pancakes carefully, as the second side always cooks faster than the first. Serve immediately and warm with warm maple syrup. 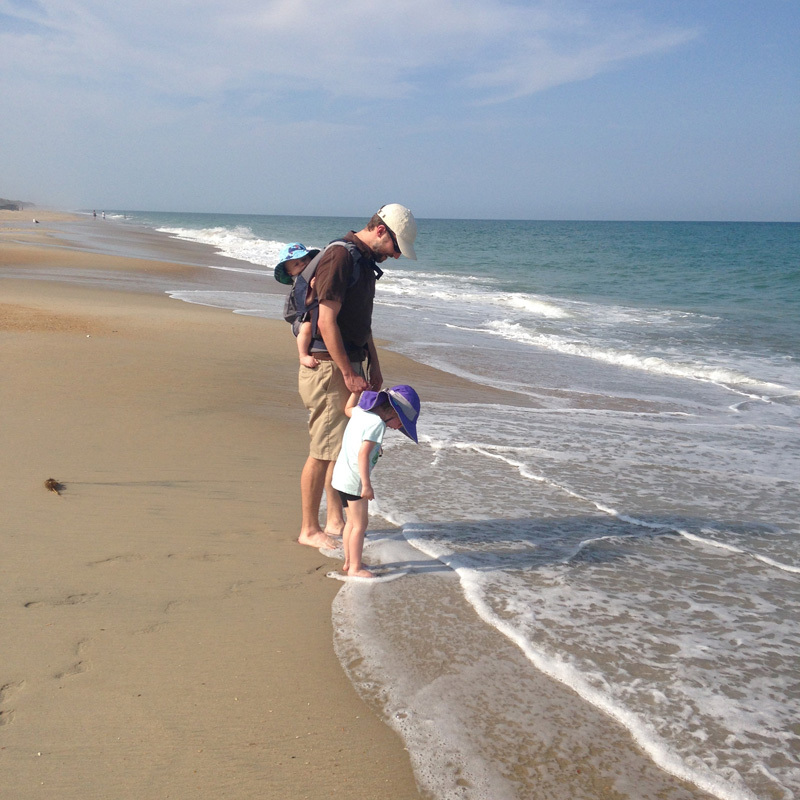 We spent a nice chunk of our June in North Carolina for a family vacation at the beach and visiting Greensboro. 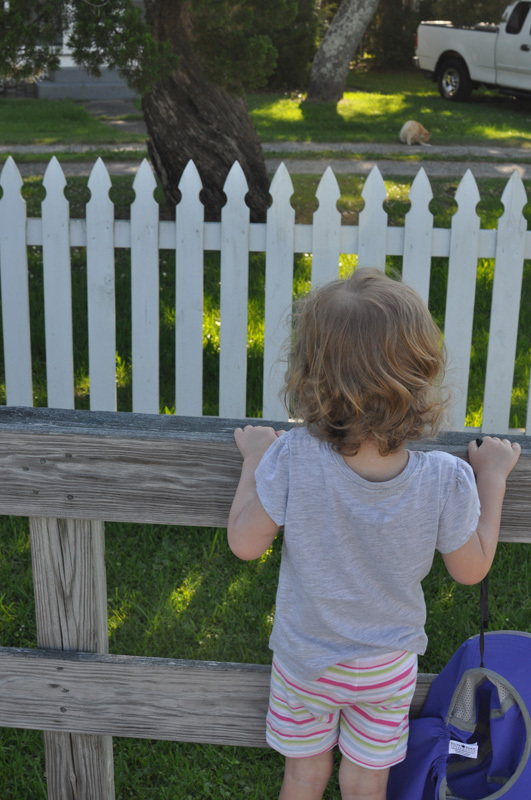 This was the first time we had been back since moving to Iowa two years ago. The 3,200 miles we logged in our 11 day trip was worth the memories and beautiful images that I have been revisiting. 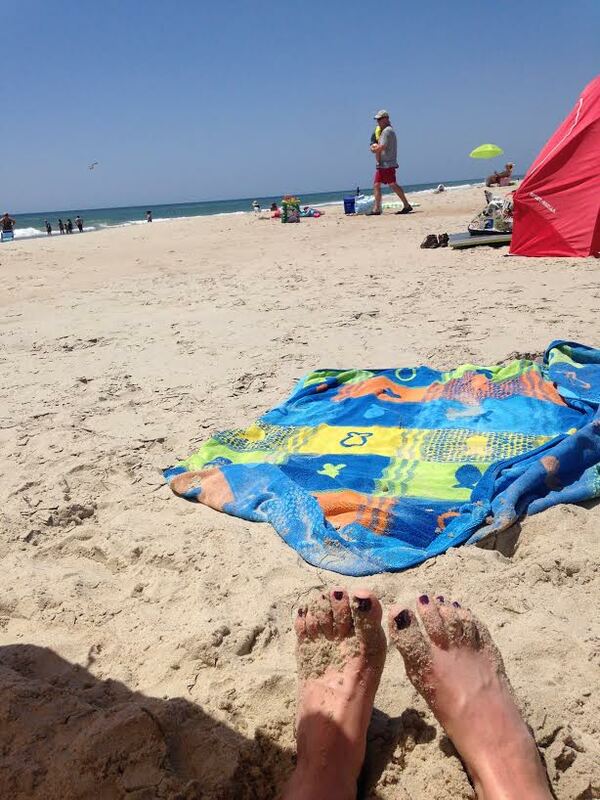 This lovely beach is on Ocracoke Island. 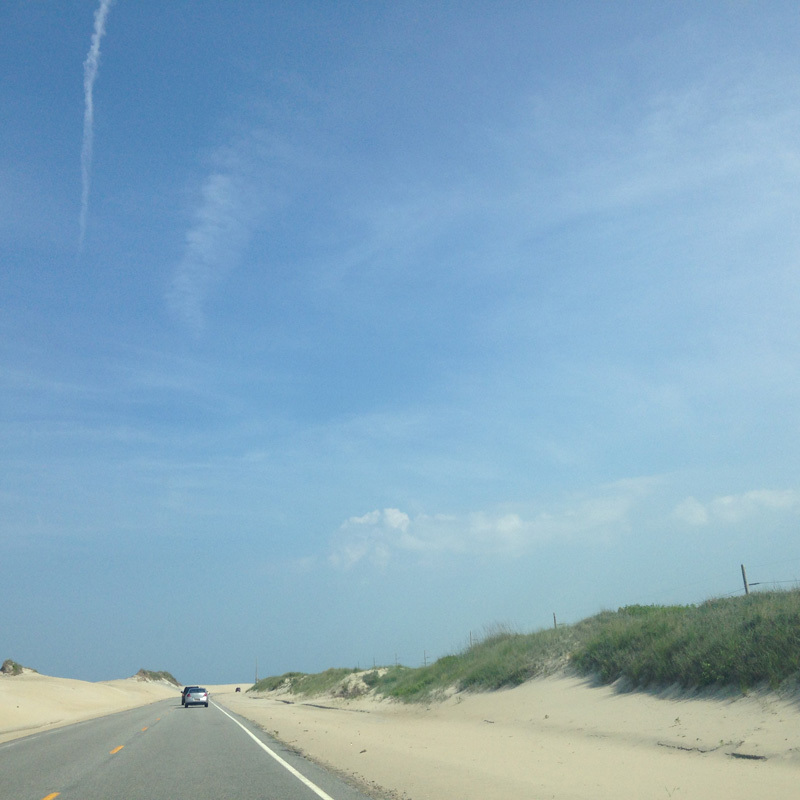 We reached Ocracoke Island by driving south along the barrier islands on NC Highway 12. 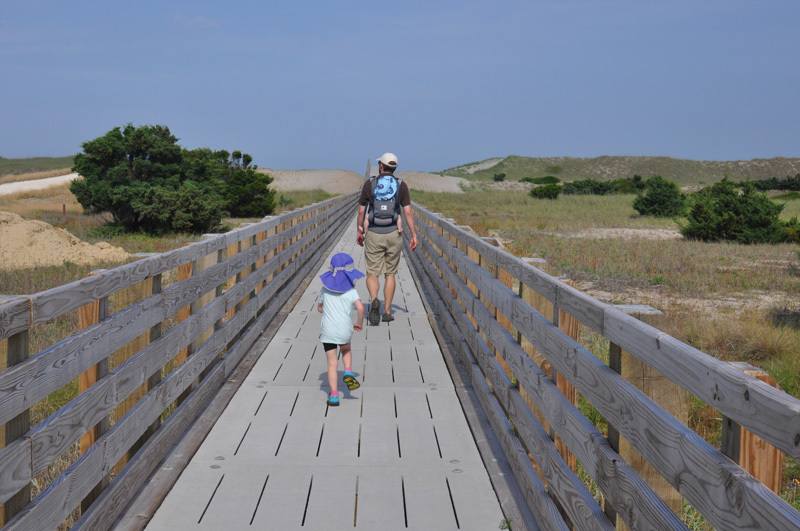 This is the longer route, but it is very scenic, taking you over the Oregon Inlet bridge, through the Pea Island National Wildlife Refuge, along the Cape Hatteras National Seashore, and past numerous towns and several lighthouses, depending on how much of Highway 12 one travels. In our younger years, Eric and I rode the entire stretch from Nags Head to Ocracoke and back to Nags Head by bicycle. We were trying to race a nasty March storm and rode the whole 80 miles back from Ocracoke to Nags Head in one day. 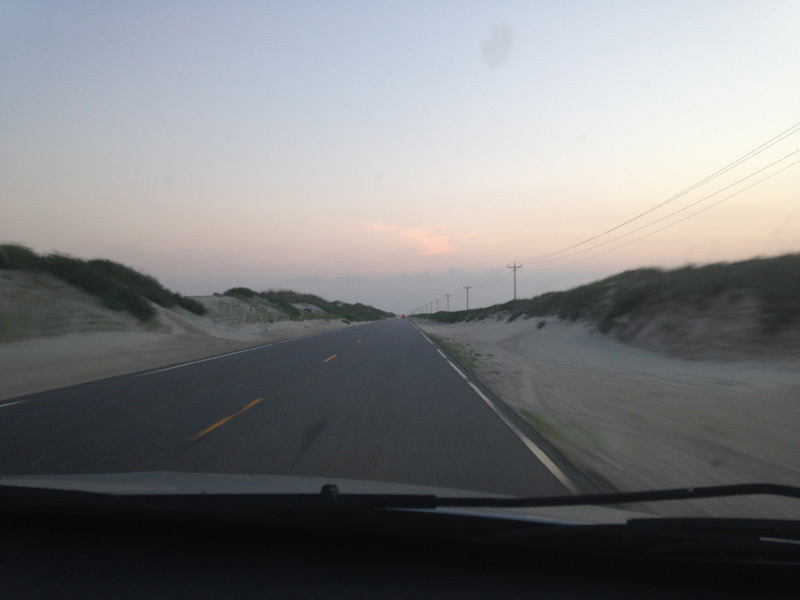 I can still feel the sand blasting my face along this stretch of desolate road. The kids were exhausted of the car and itching to get out and see the scenic surroundings. We stopped at a beach access point before the ferry to Ocracoke, near Avon. The girl is running full speed ahead to reach that ocean! I call this one anticipation. It will become an artwork at some point. The urge to be a part of the ocean was just too much – she was soaked and sandy by the time we were done. 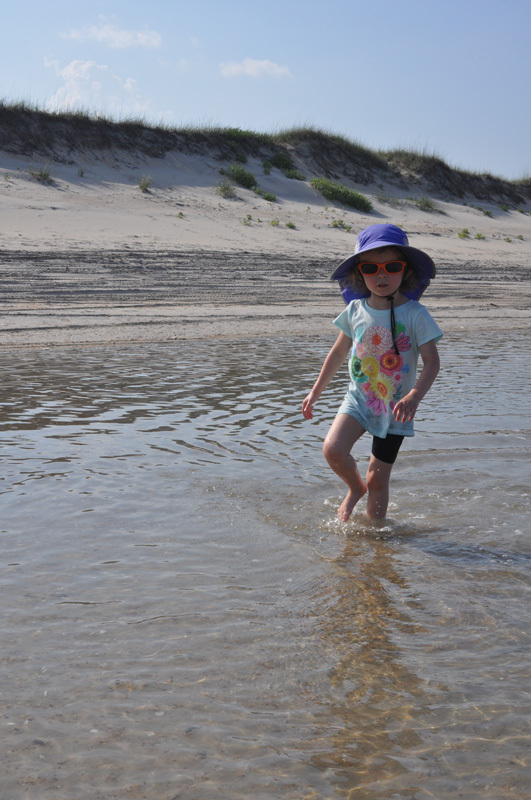 This girl’s water-loving viking heritage will call her to the coast too. 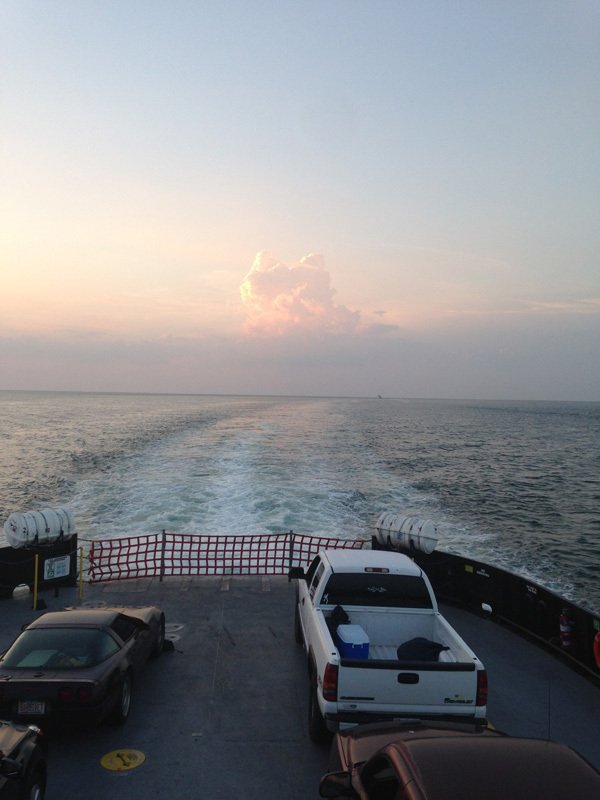 After a fantastic seafood dinner (truly one of the best I have had) at the Dolphin Den, in Avon we boarded the ferry to Ocracoke. This little guy slept for the first part, but awoke to seagulls, waves, and his excited sister. We had enough evening light for a selfie. I do not think it is a coincidence that ferry sounds like fairy. There is something magical about these boats. 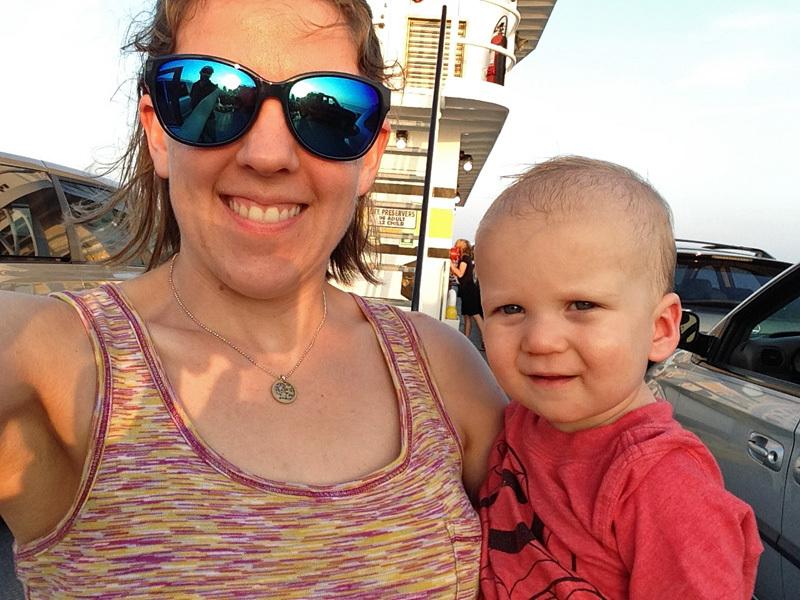 We got off the ferry and continued our drive onto Ocracoke. This stretch is one of my favorite roads on earth. I even immortalized it in a painting a few years back, I will have to dig that out of storage. Once on Ocracoke, we took things slow. We spent some time at the beach. 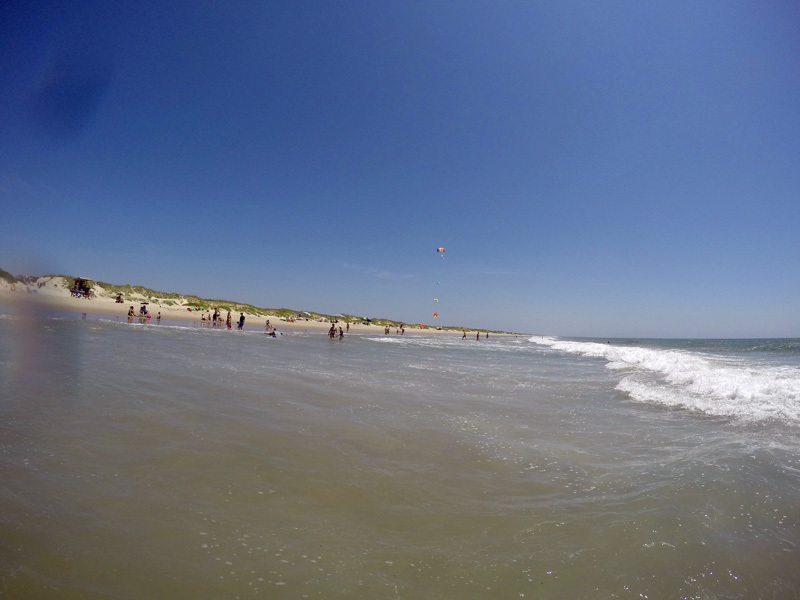 This is the very beach where the most recent North Carolina shark attack happened, actually in the exact spot we were swimming in the water too. Shudder. We ditched our car and opted for our cargo bike. 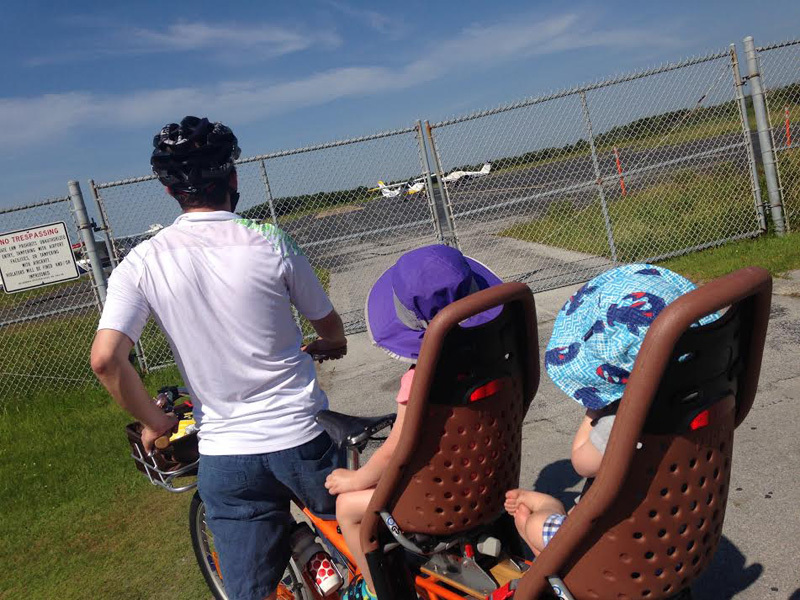 The kids enjoyed watching the small planes land and take off at the airport. 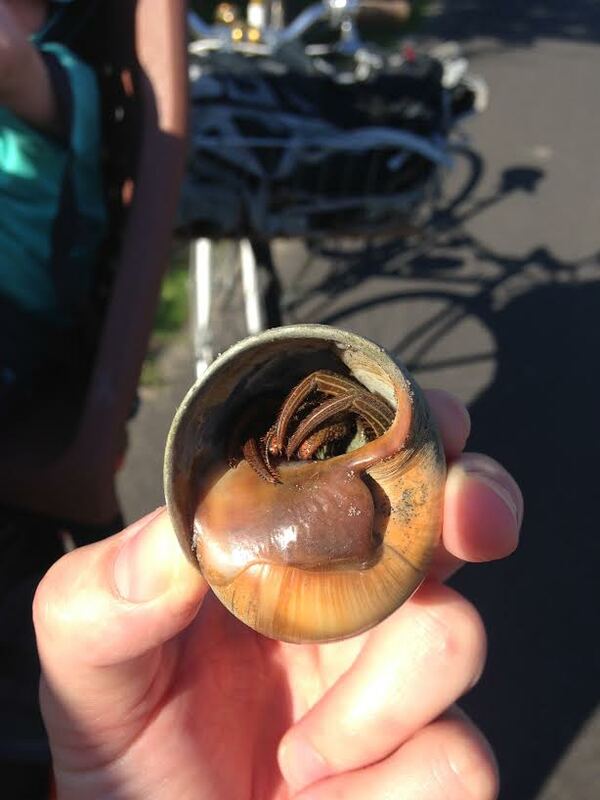 On our bike ride to the Ocracoke Lighthouse, we found this little fellow crawling across the road. I had never seen a hermit crab just out walking before. 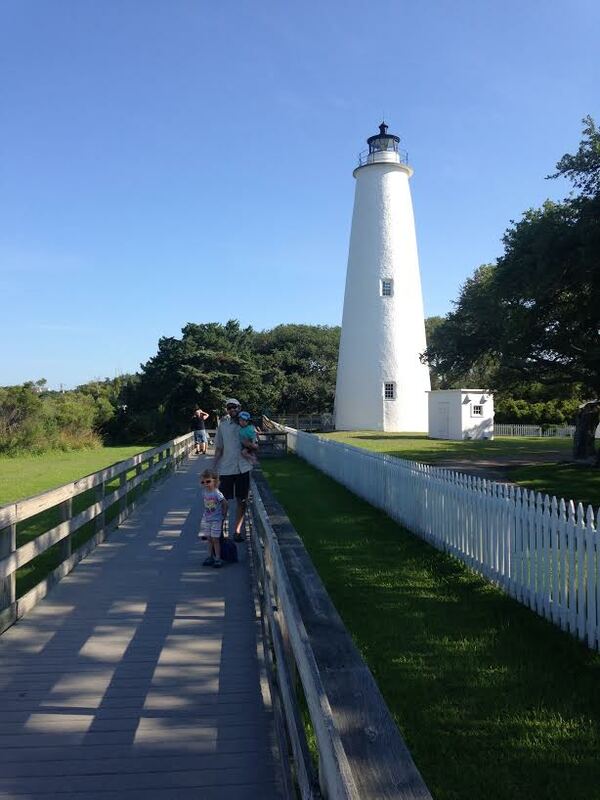 The Ocracoke lighthouse is always a little shocking to me, in its stark white form. Greta was more interested in the marmalade cat that was grooming itself just out of her reach. 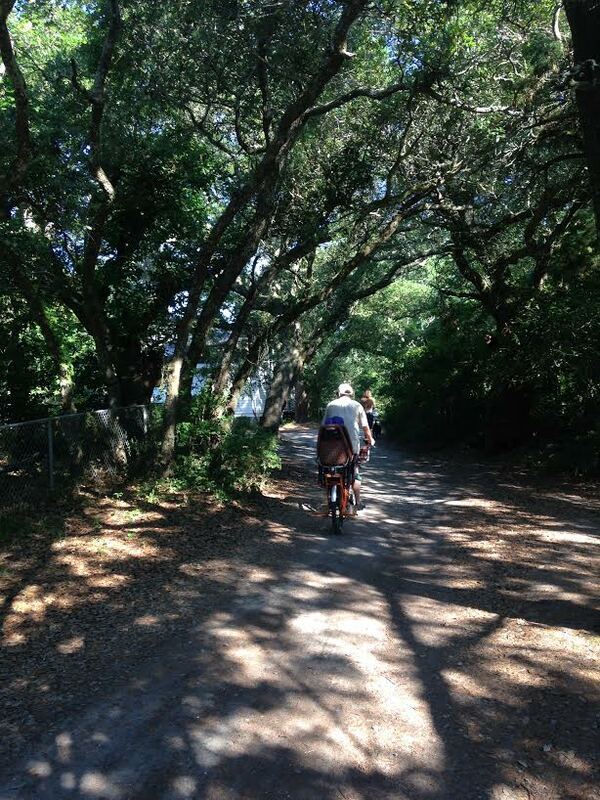 The small winding roads, cloaked in live oaks are always a treat on sunny hot afternoons. I feel like I have stepped back in time. 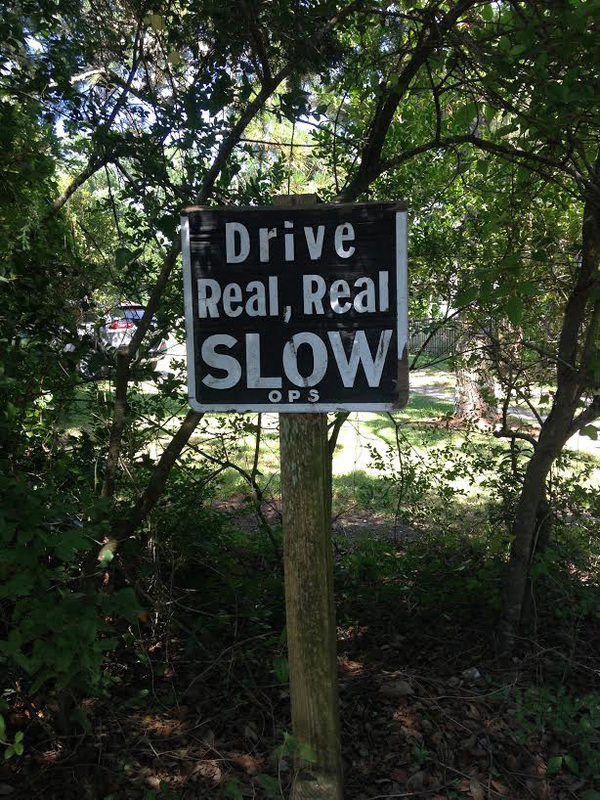 I love this sign on Old Howard Road. It truly needs a y’all in there, though. 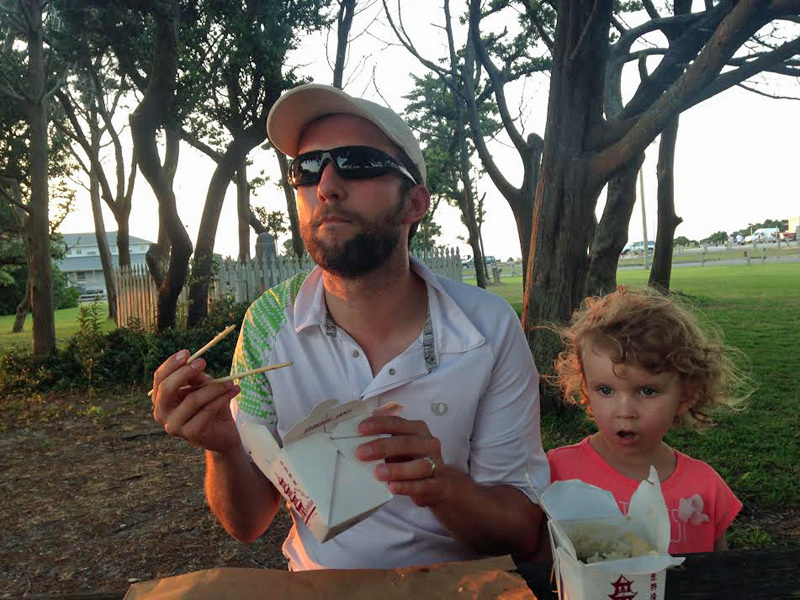 We got take out from Thai Moon and it took it to the picnic area just outside the Ocracoke Visitor Center to watch the ferries. It was one of the nicest and breeziest spots on the island, outside of the beach. We enjoyed a breakfast at Dajio. This is the massive apple pancake which had thinly sliced apples, caramelized, on the bottom of the most perfect fluffy hotcake. My sailor dressed daughter is enjoying the fruit and yogurt parfait. I would also recommend the shrimp and crab omelet. Heaven on a plate. We enjoyed dinner at the Jolly Roger with our friends from Greensboro. 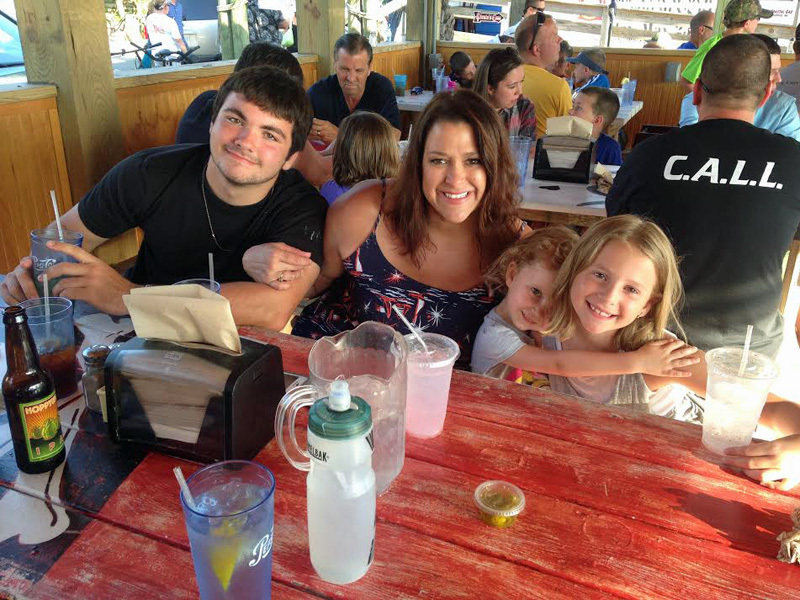 This marina and restaurant has excellent seafood and terrific hush puppies. After three glorious nights of being at the ocean, we left by Cedar Island ferry to mainland. I felt a little squashed up inside, not knowing when we would be back to this place I love so much. I actually keep it as one of my locations on my weather app on my phone. I love to see its steady 70° rainy afternoons when snow is pounding and drifting in Iowa. The almost three hour ferry ride back was a nice slow way to say goodbye to the coast. I may or may not get around to blogging about Greensboro. My days since returning have been filled with my babies having birthdays, finishing up a grad class, jury duty, and germs.